Marine Le Pen is a far-right candidate for the French presidency, and the president of the French political party the “National Front”. In the beginning of her campaign, she was an outsider candidate, with central-right candidate Francois Fillon the early leader in the polls. 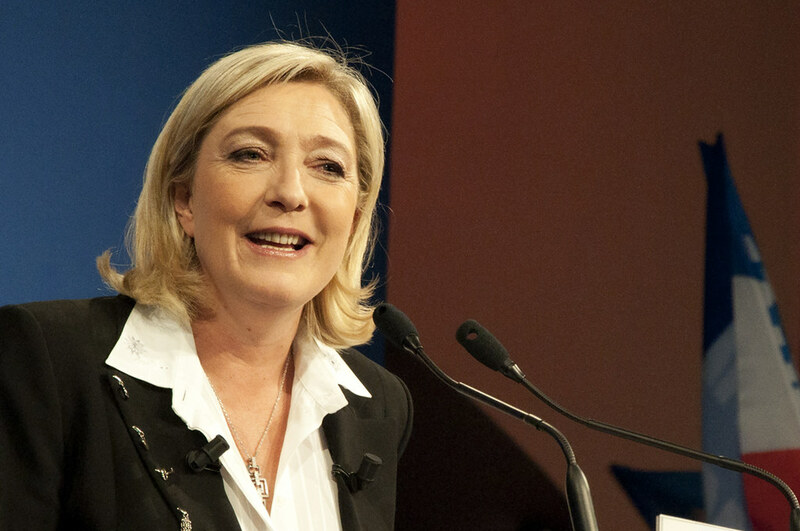 Due to recent a recent scandal involving Francois, however, Le pen has arisen as the second favourite behind the “Socialist Party”s Emmanuel Macron. Le Pen has made many of her headlines in the same way as Donald Trump had in the American elections. Taking a hard-line on immigration, Islamic terrorism, the European Union, and Globalisation. Much in the vein of Trump, Le Pen is trying to play on the patriotism of the French people and their want for change. Looking through her tweets, many of them contain the word revolution. The connotations of the word alone seemingly trying to play on the patriotism of the French people. I decided to analyse her campaign from March 22nd to March 31st. This was an interesting period as not only are the elections upcoming, but they also coincide with several public appearances by Le Pen. There are many key aspects of a good campaign in modern politics. The first thing in which a politician must decide is their campaign slogan. This slogan is the first thing that will pop into most people’s minds when thinking about the candidate. With Donald Trump, we had “Make America Great Again” with Obama there was “Change we need” and more memorabley “yes we can”. It is a necessity to have not only a slogan which is short and memorable but also representative of your focuses. Marine Le Pens campaign slogan is “au now du people” or in English “For the people”. Although generic in essence, it qualifies in the aforementioned three categories of a successful slogan. How does this line up with her campaign? Well, in her campaign she focuses heavily on the restoration of power to the people, saying “The new world that is arriving is a world where the people regain power, where the oligarchies are put back in their place” during a rally in Lille. This kind of focus and sentence is a form of propaganda/persuasion which Le Pen is using. This sentence here would fall into the smoke and mirror category and would be a glittering generality. This meaning that it is an emotionally appealing sentence which is associated or invoking of positive thoughts, without much need for proof. The same could be said about her slogan overall. The next key aspect of a successful campaign is the use of a symbol, and furthermore, the imagery used throughout the campaign to invoke certain feelings. 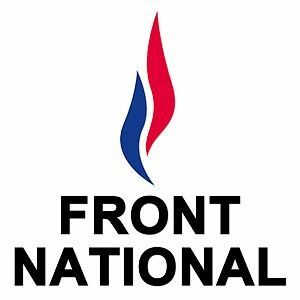 The main symbol being used by Le Pen is a blue rose, as opposed the National Front’s typical logo of a blue and red flame. If you look deeper into the connotations though you can see why she chose a rose and a blue one at that. The rose is also associated with the socialist party in France, and blue is the associated colour of the far-right, Le Pen saying that the logo is supposed to be representative of her wanting to bring all the French together. It is also said by FN officials that the rose being blue is supposed the represent “Making the impossible, possible”. The next analysis-worthy part of the logo is the dropping of her second/familial name. It is very uncommon for someone in politics to use their first, and their first name only, in their campaign trail. Although, it appears it may be a common thing amongst women in politics, as Hillary Clinton did the same thing in her efforts for the American presidency. There are a few reasons why theoretically Le Pen, or Marine, ran with her first name in the election. Firstly, there is an ongoing political feud between Marine Le Pen and her politician father Jean- Marie Le Pen. Jean- Marie Le Pen was known for anti-Semitic and racist comments, so Marine dropping the name is most likely an attempt to distance herself from him. If you analyse her rallies on the campaign trail there is a lot of this appeal to the ‘plain folk’. In the window which I analysed Le Pen visits a farming community in Pordic, in North-western Frances Brittany region. As you can see in the photo she finds herself giving her speech in front of these bales of hay. 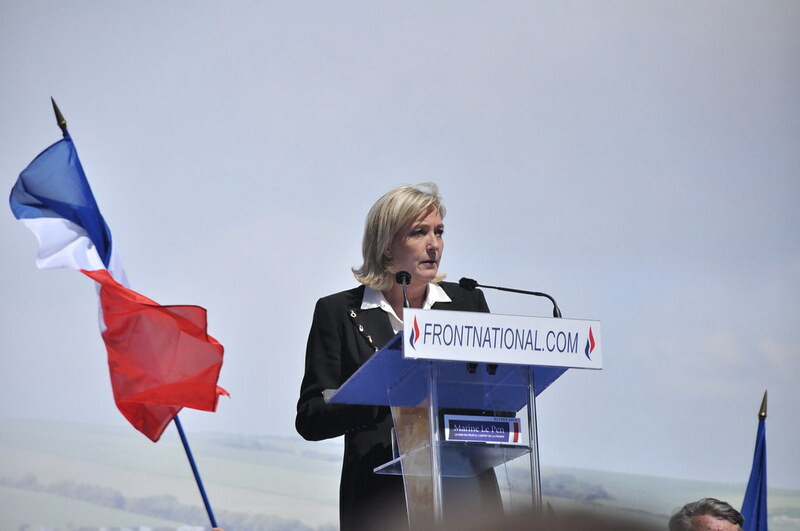 The French flags behind her, and her campaign slogan to her right-hand side. She discusses her humble heritage saying “I like the Bretagne because they are my origins, and it’s a warm land.” She also dresses rather casually in a casual blouse, a pair of jeans, boots, and casual jacket. Relating herself to the rural farmers, helping to create a “she’s one of us” mentality. This is plain folks form of persuasion as well as what is known as a Granfalloon “An informal, non-membership group created by the propagandist for the sole purpose of producing proud and meaningless associations who then perceive great solidarity within the portrayed collectivity”. “Strategic Political Communication: Rethinking Social Influence, Persuasion, and Propaganda”The excerpt is taken from Karen S. Johnson- Cartee’s book. She’s creating a feeling of togetherness amongst this small farming town and making them feel as if she is one of them, and with that, that she has their best interests at heart. This is also a form of persuasion/propaganda using prior events to reinforce your stance, known as a ‘retrospective fear appeal’. It can be explained, as X and Y, and it was horrific, and if Z occurs, it will the same but even worse. She cherry picked a negative event which occurred in the region involving a migrant, to further enforce her stance on a tougher border and stronger immigration laws in France. In the same rally, Le Pen uses appeals to patriotism, which is one of the ‘likely manifestations’ of political propaganda in Johnsen-Cartee and Copeland’s book “Strategic Political Communication”. This also aligns with the use of the flags as a symbol of patriotism which is another form of political propaganda. There are several statements she makes during this appearance that endorses this technique, the first being: “The direction of France Télévisions is in a friendly relationship with Macron and the French are not fools.”. Much like Trump’s claims of fake news, Le Pen says the media give a skewed view of her, to show a more favourable view of her main opponent Emmanuel Macron. In conclusion, Marine Le Pen uses a staggering amount of persuasion and propaganda tactics throughout the two-week period which I analysed. The main tactic being her appeal to patriotism, which she has used as a cornerstone of her campaign. In a world where Donald Trump is the US president, and the UK is looking to leave the EU, it appears that the far-right is beginning to gain some traction in the political playground. Is this the start of a new approach to democracy and political strategy? Are the public tired of social and ethical pandering, and political correctness? We’ll have to wait and see for the answer to those questions, but one thing seems certain. Liberal heavy politick in the western world is beginning to take a step back to the propagandists and fear-mongers of democracy. Cross-county retail investigation: How do bra fitting services measure up in Galway & Dublin?